It's that time of year again, when the heat forces people to flee towards bodies of water. This makes my buddy Shark pretty happy, easy meals are good feels. When Shark is happy, prices drop. It's a summer sale event, Chillin' with Shark! That's right, for the whole month of July, The Great White Destroyer is on sale, and the price depends on the dice. Let me explain with the power of video. Let me reiterate the rules here, in case your brain melted from the awesome. -Every Monday during July, I'll roll three 10 sided dice, the sum of these rolls + %30 is the total discount for that week. -Anyone who has dice can make their own roll on video, if it's higher than mine, it becomes the new discount for that week. The video must contain no cuts in action, I have to see the dice roll and land. So it looks like the first days of July have a %50 discount, not a bad start. Who knows how low it will go come Monday? Check back and see. Convert prototype is what I'm calling it at the moment. That little experiment I started last week. I liked what was going on with it so I dumped the Backyard Ninja avatar and went with a proper control scheme. Presentation wise, this is bare bones, all placeholder art, just the gameplay itself. Genre wise I think it falls somewhere between tower defense and an rts. I'm putting it up for free for people to try out. There's only 3 stages at the moment, I'll be adding more every week. When I get all the gameplay elements represented I'll consider turning it into a full game, art, music, all that jazz. Until I get a proper link on my webpage, use the one below. Feel free to leave feedback here, or drop me an email, backyardninja@dumbmanex.com . 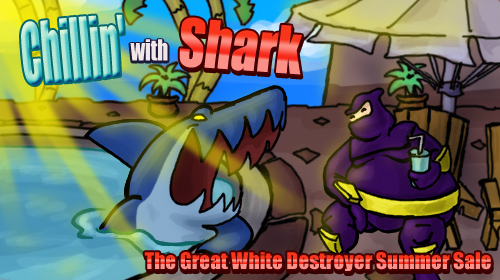 The Great White Destroyer News, no work to show this time around. I am devising a sale for next month however, more info on that later this week. No video, only this blog post. Rats and crap turds! I've simply been too worn out these last few weekends for the video bullcraps. So here I am, posting some update stuff about a few things. The Great White Destroyer ver 1.4, it keeps on rolling. Here's the rub since last time. The Gun Cops are the first line of assault and only show up after Shark is caught breaking the law. They'll close in and begin firing slowly, and will reload when out of bullets. That's your chance to rush in and disarm them, or eat them, whatever. Shotty Cops are a lot like Gun Cops in behavior, with a few differences. They're slower, and like to get a little closer before shooting. They fire spreads of bullets naturally, but unnaturally the bullets travel slower than normal. I love the name Swat Cop! Trained in the art of Three Shot Burst, as to be deadly and quick. These guys not only shoot Shark with their cool auto-rifles, but sport some tear gas as well. 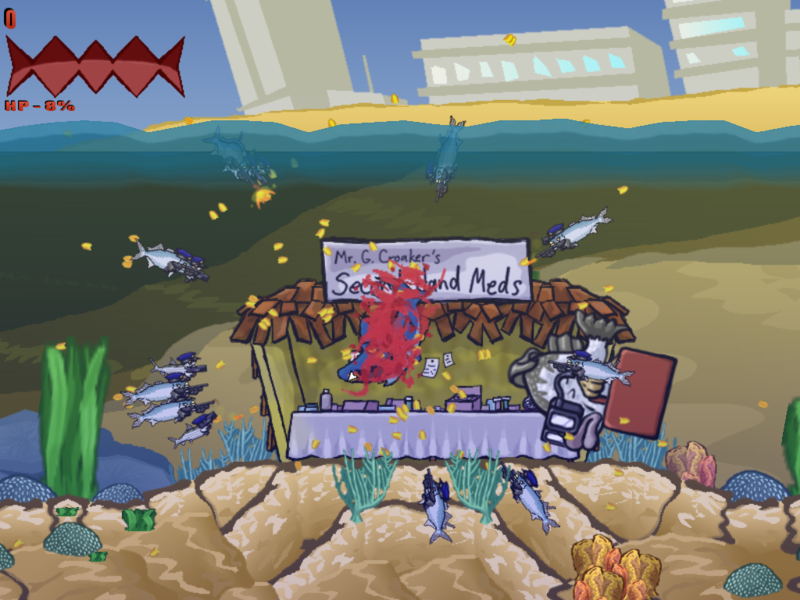 As you can see, to save some time I re-used some art from the other fish and added to them. It works out very well, they look great in action. Next up I'll be working on the law escalation system, sorta like the Grand Theft Auto thing. Instead of it resetting every time you evade the law like in GTA, it continues to increase unless you avoid breaking the law for a while, or take a day off, or wear a disguise, but more on those mechanics at a later date. Plus, lets all shoot Shark! Hellhol news, there is none. The game is not forgotten, I've just been busy. Free Stuff will get a few more bits sometime tomorrow. 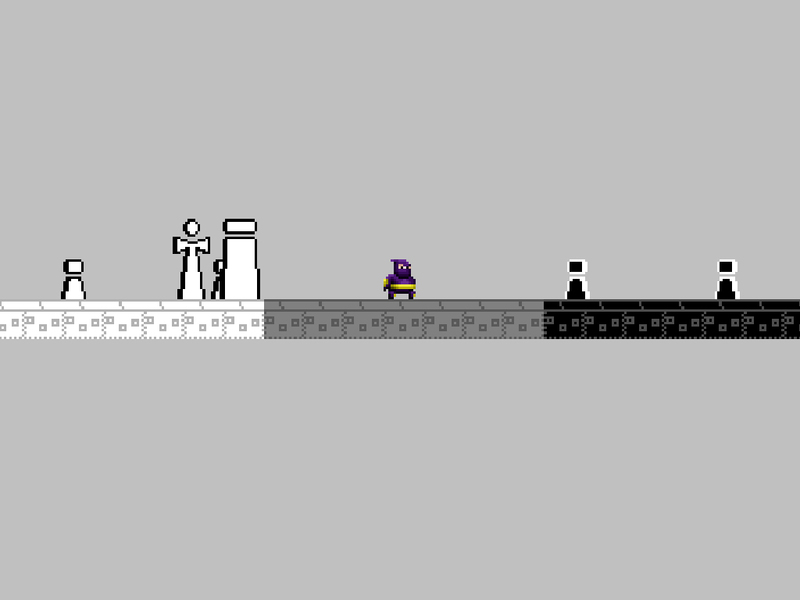 That crappy Fall/Winter tileset will get on there, as well as another character from the defunct Snowball's Chance 2. Backyard Ninja Adventures I'm toying around with this freebie game here where I showcase different game mechanics in a 2D sidescrolling fashion. This thing here is a take on one of the first games I piddled around with, dealing with taking territory by directing flows of units who behaved in predictable patterns. Anyhow, I'll probably make a few stages based on it and put it out there, see what people think. More at a later date. Summer can be a bummer! I'm talking lousy humidity and high temperatures. I'm talking sweat is yanked from you even while in an air conditioned environment. I'm talking, being miserable and wanting to slouch the day away. At least until you get used to it again. What? Video? Yes, of course.